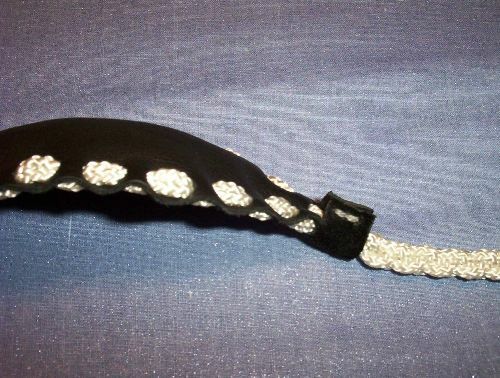 Here is my newest sling. I got some #72 seine twine from the Memphis Net and Twine company (look them up on the web. Full mail order and lots of cool stuff including cannon ball molds for up to one pound.) Anyway, this thing is the most substantial sling I have made. The cords are stiffer and bigger. I hope to throw some concrete balls with this one soon. And, while I am still no whipartist, I figured out how to plait the 8 strands at the loop into a square plait without doubling up on the cords. Hey let's face it dude; your design is awesome! I love it! And great braiding of the 8 strands. Looks great and tight. That braid is called cowtail or 4 seam in whipmaking. I like how the cords go around the pouch to secure the shot. I think you will be able to throw concrete balls pretty easily with that one! I guess the Baleric Islanders used a couple different size slings too. Wound them around their waist and head when the went out or something. They reportedly threw baseball or softball size stones, can't remember which size. Maybe Chris knows. It's been a while since I've read it. Ben <>< Who likes the black and white motif too. Now I'm confused. To make the loop, obviously done in 4 strand, you folded it over and plaited the 4 strands back over the original braid, using the original as a core? It looks like an 8 strand braid to me but it's hard to tell, because the twine is confusing to look at. Anyway, hope you understand my question. Ben, who is still impressed, having developed skill over 10 long years of whipmaking. And who still likes the black and white motif. No core in the part below the loop. I actully did an 8 strand plait. I take the upper strand of one side around the back and up through the other side. With four, I grab one strand and the lay the working strand back on its original side. With eight I grab two, with sixteen I grab four strands. It always comes out square. In fact, the more strands, the more square it looks. The low res pics make it a bit hard to read, not to mention that unusual blue background I am using. I have only learned to plait to make my slings and this is as far as I have been so far. I would like to make a round plait with 16 strands, but think my brain would short circuit if I tried it at this point. Thank you for the compliments. It is nice to know I am doing something well. Check out my article in the article section. This is really not that difficult. I does take a little patience as you are learning, but once you get started it actually goes pretty quick. I use some time saving measures for the pouch, which knock off quite a bit of time. 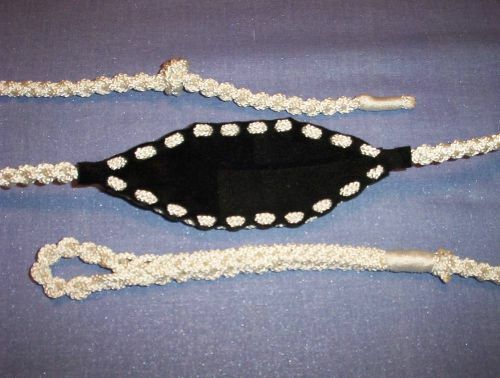 I would like to figure out how to make one without cord through the pouch, but still use the plaited cord. It is strong, light and probably more durable than leather. Ok I get it. Good thinking. I was starting the work from the wrong end in my imagination. The 16 round is as easy as anything else. The difference between round and square is whether you have a core or not. If you use a 1 strand core on a 8 strand braid, you'll still have a square braid. But if you use a 4 strand core on an 8 strand braid and it will probably turn out round. If you use an 8 strand core on an 8 strand braid you'll have gaps in your work. The 4 strand braid involves under 1 over 1 on each side. The 8 strand involves under 2 over 2 on both sides, the 12 involves under 3 over 3 on each side. The 16 is under 4 and over 4. and the 36 strand braid is under 18 over 18. 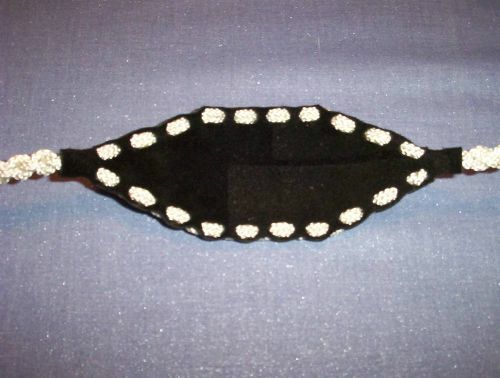 You can go under over under over under over to do a single diamond pattern, and the possibilities become endless. If you go under 2 over 2 under 2 over 2 in 16 strand you get 8 seams instead of just 4. So your braid would then be octagonal instead of square, whether you had a core or not. You can do the same with 8 going under and over 1 strand. The important thing is to remember when using a core is that you don't have to braid tight. Pull hard, braid loose. The braid tightens up above where you are working. The actual weaving of the strands can be done loose as long as you pull the strands tight prior to placing them in the right order. It's far easier to do this with a core. You keep the core in your hand as you work and it helps to keep track of what you're doing. With whipmaking you set your work on a loop about chest height and just walk backward as you braid for hours and hours. Half your strands fall to one side of your core and half to the otherside. The exception is of course a braid without a core. You have to keep constant tension on these. The red and black slings that I made in the picture gallery use simple 8 strand braids over a 4 strand core. I did them in 2 or 3 colors. Very simple stuff. I used regular 4 ply yarn. The new sling uses 16 strand Peruvian braids done in a totally different manner. To be technical, a braid with a core is a plait. Plaiting large #'s of strands is far easier than braiding them. In otherwords, using a core makes working large #'s of strands a lot easier than not using a core. Even if the core is only 1 strand, it gives you something to divide things up, and something consistent to hold onto. Ben, who likes to talk about braiding. I don't know specifically Balearic Islander's projectiles, but sizes at least as large as tennis balls were used. It was also common for people to carry more than one length sling, especially in military situations; they had one for medium range and long range. Their really isn't such thing as a short range sling because if the enemy ever got that close, the ranged-troops would either flee or switch to melee weapons. Well, Ben, you have succeeded in totally frying my last synapse with those explainations. I would love to learn to do those things, though. Is there an online resource which has illustrations? I am very illustration oriented. A good book that is not too expensive would be nice also. The eight strand plait is probably most interesting at the moment. 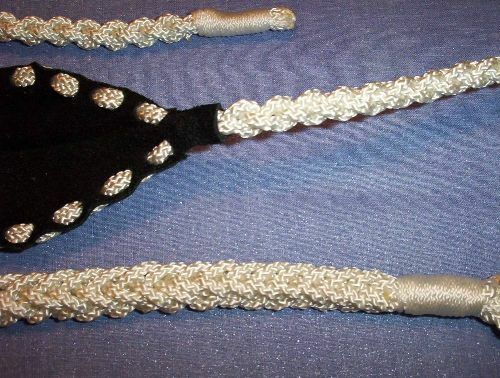 I could make a sling with a four strand loop and an eight strand plait all the way through the pouch to the release end. My current method makes it square, but I want it round. What about some more explaination on the round stuff for me. Maybe by e-mail to cut down on space here. I am particularly confused about the core part. Maybe I am using a strand as a core after all. How do I make a four strand core in the eight strand plait? What does it look like? Anyway, e-mail me and we will see if I have an anurism. Thanks Chris. Tennis ball size sounds about right to me. I think it must have been baseball size I read. Jeff, I'll write you here in a bit. My faucet broke and then developed 4 leaks after I repaired it. And I got depressed about some other stuff for a little for a while. Then I debated the existence of God for a while. Then I watched a John Wayne movie and pretty soon I'll send you an email. Looking forward to the information. I found a short video on the web that showed how to make a snake whip from nylon cord. I did this, hoping it would inform my plaiting. It did not. All I got was a very light nylon whip that is almost impossible to crack, and makes the arm and shoulder sore from swinging. Sorry about the depressing times. Jesus has not left the throne, however. Even King David despaired, but did not loose hope. Hmmm, no core for the snake whip? It should have had lead shot in the core to be officially a snake whip. I did send you an email from whipartist last night. I hope you got it? Thanks for being sorry. I'm not depressed anymore. Just a little tiny bout Maybe David was depressed that he wasn't a youth out slinging, and instead had to be a King. Or maybe it was being chased by Saul all over the countryside for what he did with his sling. Never can be too careful what direction you sling in huh. Let me know if you didn't get the email and I'll put it here.